With a sweep on homecoming night against the Colgan Panthers, the Girard Trojans were back in action Tuesday, Jan. 29. 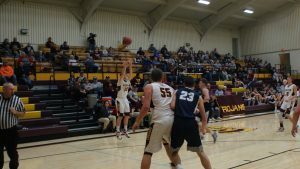 Girard met with familiar CNC opponent the Galena Bulldogs as the Trojans come around the part of their schedule where they will meet CNC teams for a second time. For the Lady Trojans, in their last game against Colgan, they narrowly escaped 42-38 continuing their hot league play (6-0). Tuesday, Girard (10-2) met with Galena (5-8) as their last meeting resulted in the Trojans escaping the Bulldogs 50-42. It was a different type of game Tuesday night as Coach Herlocker and his team as the Lady Trojans came out ready to play. Full-court pressure defense caused major problems in the first half for Galena which would result in easy transition baskets for the Trojans. Senior Kalyn Flaharty and sophomore Jaada Valley became the focal point of the Trojan’s offense in the first half. Girard’s ability to reload off the bench proved to be troublesome as the Lady Trojans pushed the lead to double-digits at halftime leading 25-12. The Lady Trojans continued to pile on the lead in the second half as key emerging freshman Faith Poland carried a heavy portion of the Trojans attacking the Bulldogs inside. Valley continued her strong effort in the second half as well with her ball-hawking defense forcing turnovers and drawing fouls getting to the free throw line. Girard’s lead would grow to become too much for the Bulldogs comeback effort as the Lady Trojans (11-2) went on to win 49-29. Valley finished the game with 13 points with a heavy majority coming from the free throw line as she went 7-8 from the charity stripe. Freshman Poland made a strong contribution as well scoring 11 points for the Lady Trojans. “There were some things tonight I thought we executed overall really well… overall execution-wise, it couldn’t have been any better,” said Coach Brad Herlocker. For the boys, they come off a convincing 47-38 win against a tough Colgan Panthers team. Girard (11-1) met with Galena (7-5) Tuesday night as in their last meeting, the Trojans handled the Bulldogs 53-39. It was all Trojans from the opening tip as Girard came out red hot offensively and defensively. All starters for the Trojans found their way to the basket in the first quarter with Galena not able to match Girard’s effort. Seniors Evan Troike and Caleb Muia provided a hefty portion of the Trojans scoring in the first half combining for 23 of Girard’s 34 points. The Trojan defense came ready to play as they had their best performance of the season defensively allowing the Bulldogs to zero points in the second quarter. Girard’s lead grew to almost thirty points at the half as the Trojans lead 34-5 over Galena. The Trojans maintained a comfortable 20-point lead for the rest of the contest as a running clock ensued in the last quarter and starters were sat out most of the second half as well. Girard (12-1) went on to demolish the Bulldogs 46-21 keeping their team still in contention for the number one spot in the CNC. Muia led the game in scoring for the Trojans Tuesday night with 15 points and Troike followed behind ending his night with 11 points. “We hit shots early, that always helps stretching out the defense, then we were able to get to the rim…Defensively I thought our kids played really well,” said Coach Rod Wescott. The Trojans will travel to Anderson County in their next matchup Friday, Feb. 1 as both teams look to continue their momentum.